Sean Power T.D. Minister for Services for Older People at the Department of Health and Children spoke on the matters outlined below. Ageing Population: By 2036, the population is expected to reach 1.1 million people aged over 65. It will have wide ranging implications for pensions, health and long-term care. It is important that continuous liaison between Government and Older People’s groups organisations take place to ensure that the needs of older people are addressed. Government Policy: Continues to be that older people receive the attention or care they require in their own homes and communities for as long as is possible. In 2006 the cost for services for older people was 150m. For 2007 the cost is estimated at €255m. Community Based Supports: 2,000 extra home care packages will be provided in 2007. There will be 780,000 extra hours of home help and 1,100 extra day care places. Carers: He praised the importance of family carers in allowing older people to remain at home longer than would otherwise be possible. He referred to the increase in benefits for Carer’s in the last budget in line with Towards 2016 and the Programme for Government so that all those on average industrial incomes qualify. Effective June the Respite Care Grant is €1500. Long-Term Care: Draft national standards for all residential care settings for older people were published on the 25th January and the interim Health Information and Quality Authority have established a working group to oversee public consultation on the standards and to finalise them. A Fair Deal: It is planned to introduce a new nursing home care support scheme – A Fair Deal – at the start of January next year. It will provide uniform financial support for individuals in private and public nursing home beds. The Fair Deal will ensure that the State continues to fund the largest part of care costs overall. Contributions during a person’s life will be less than their disposable income and they will not have to sell or mortgage their house to meet the contribution. A person’s family will not have to contribute towards the cost of their care.For 2007 a new subvention scheme has been introduced. The maximum rate of a basic subvention has now been raised to €300 and €85 million allocate to it as a down-payment to ease current inequities. Attitudes to Old Age: Referring to the need for a more positive attitude to ageing amongst older people themselves and the population in general he praised the valuable contribution of the Irish Senior Citizens Parliament over the years, in promoting the interests of older people. Three Workshops were held on the “Fair Deal” proposal which will help to inform the Parliament examination of the matter. The facilitators from the Department of Health and Children, Services for Older People were Dr Fergal Lynch, Geraldine Fitzpatrick and Laura McGarrigle. 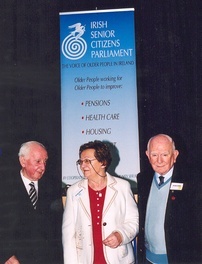 Chairpersons were John Brady formerly of the Department of Health and Children, Bob Carroll, Director National Council on Ageing and Older People and Maurice O’Connell, Alzheimer’s Society. Speaking she said it was a real privilege to be to hear some of the motions being put before the annual Parliament meeting which touch on so many of the important issues which face all of us as we get older. The CEO had told her that to understand the Parliament she should see it in action and this was absolutely right. The great work goes on throughout the year, all around the country locally in your divisions as well as nationally. Her hope for the future is that your work will be enhanced by Atlantic’s grant and that local, regional and national networks and representation will be strengthened. The aim ultimately is to strengthen the voice of older people so that the so called ‘grey vote’ will be heard clearly, powerfully and unambiguously. You are not lobbying for are ‘handouts’ but basic rights based on respect and dignity for all citizens. If we do not treat all of our people well then the whole body politic suffers. As Dame Cicely Saunders famously said: ‘You matter because you are you and you matter all the days of your life.’ She expressed special appreciation to Michael O’Halloran for all his work in bringing our joint initiative to fruition. It has been like a dance, sometimes a very slow waltz, but hopefully now the tempo can speed up to a quick step. The following is a summary of the outcome of the motions by subject matter. Motion 7 seeking to have the Qualified Adult payment at the same level as the main recipient was passed. Motion 21& 22 calling for the equipping of all Post Offices with Audio Induction Loops by December 2008 in accordance with the Disability Act 2005 and also that all Dublin Airport Check in areas be similarly equipped prior to the holding of the AGM of the EU Federation of Hard of Hearing people in March 08 was passed. 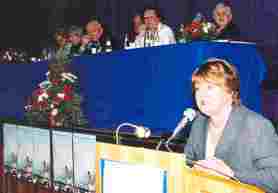 Motion 23 demanding in this year of Equal Opportunities and end to all discrimination against Older People was passed. Motion 32, 33 and 34 were referred to the incoming Executive Committee to be included in their response to “A Fair Deal”. Vote of Thanks to outgoing President Peter B Sands was proposed by Paddy Donegan who thanked Peter Sands for his outstanding term as President of the Parliament and wished him well in his new role as a Trustee. He referred to Peter’s ability to source any document from his fantastic filing system. At meetings he could take his cue from Peter and if Peter didn’t query the minutes then they were definitely OK. Peter was one of the founding members of the Parliament and he was a dedicated worker on behalf of the Parliament during all that time. The last year had been an onerous one, with Social Partnership talks and the protracted discussions with Atlantic Philanthropies. Peter had represented the Parliament very well in all those discussions. Peter never lost an opportunity to raise the issues of concern to Older People and their families in whatever forum he was in. The delegates would have seen some evidence of that today in his vote of thanks to Minister Power where he raised with him issues in the Health Service in respect of staffing levels, care packages and chiropody services. Peter Sands is a decent man and he wished Peter good health and looked forward to continuing to work with him.